Out There Nordic Sports and Camping Gear is back for their third forth year as our Ski Partner and local outdoor experts. Out There will be providing gift certificates to all the SKI division podium finishers, as well as providing support both pre-race and during the weekend. 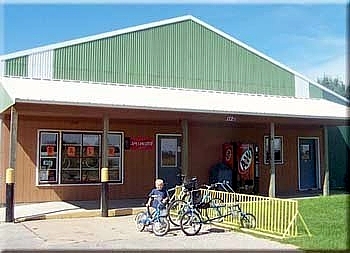 Out There is located in Rice Lake, just a few minutes from the the Race HQ and the Tuscobia trail head. Nordic recreation is a way of life for Out There’s Bjorn and Kristin and they instill this in their unique retail shop, based on traditional European Nordic shops. Out There promotes outdoor recreation year round, and believes in the idea that “The most important thing is not if you won or not, but if you got Out There!” We agree!! Look for information regarding pre-pre-race festivities at Out There. Please plan to stop in and see them, as they will have last minute prep items available for racers of all disciplines. We are excited to announce a new Partnership with Otso Cycles. Otso is now the official “BIKE” Partner. Otso is based in Minnesota and are dedicated to “bringing new and innovative ideas to the bike industry. Indeed they have with their Voytek Fatbike. Full carbon frame with one of the narrowest Q factors available (if not the narrowest) and an adjustable dropout (Tuning Chip™) system that really works. Both these innovative features make the Voytek quite possibly the most versatile year round bike you can find. We are very excited to have them on board, as we are excited to promote their bikes to you. Otso has offered Tuscobia the chance to offer an Voytek Frankset in our raffle, a $2,300 retail value! Otso also be offering registered racers the opportunity to enjoy a discount on a bike purchase. More news to come on how to take advantage of this. TC Running Company has graciously supported Tuscobia since we took over in 2010, providing discounts to racers and gift certificates to our podium finishers in the RUN division. TC Running is a prominent and trusted institution in the Minneapolis/St. Paul running scene, both on roads and trail, and they can be seen volunteering at dozens of running events around the area. Expertly staffed by some super fast guys and gals with real world running experienc, TC Running will help you with all your year-round running footwear and clothing needs. Special thanks to Kurt Decker and Adam Lindahl. Otso Cycles and Wolf Tooth Components will both be offering Discounts for registered racers, and will be supplying our bike podium finishers with gift certs. Onyx Hubs is another Minnesota company that will be joining Tuscobia as a Supporting Partner this year. If instant engagement sounds awesome, wait until you ride. And if silence sounds awesome, wait until you hear it. Don’t let snow and cold temps lock you up, Onyx hubs will just work. And the choice of colors is pretty impressive too. Onyx is supplying a hub set for the raffle – Sweet! 9:Zero:7 is back as our official BIKE division sponsor, stepping up big again this year by donating a frame set (frame and fork) as well as providing gift certificates for the BIKE podium finishers. Hailing from Alaska, 9:Zero:7 and its owner Jamey Stull know a thing or two about riding bikes in the snow. They are on the forefront of fat bike advancement and their goal is produce the best fat-tire bike frames, components and gear available. You will see a number of the top racers at Tuscobia riding 9:Zero:7. Out There Nordic Sports and Camping Gear is back for their third year as our Ski Partner and local expert resource. Out There will be providing gift certificates to all the SKI division podium finishers, as well as providing support both pre-race and during the weekend. Out There is located in Rice Lake, just a few minutes from the Tuscobia trail head. Nordic recreation is a way of life for Out There’s Bjorn and Kristin and they instill this in their unique retail shop, based on traditional European Nordic shops. Out There promotes outdoor recreation year round, and believes in the idea that “The most important thing is not if you won or not, but if you got Out There!” We agree!! The Rice Lake Tourism Board has generously partnered with us to bring you “Chamber Bucks”! In lieu of a pre-race meal, we wanted to offer racers the chance to ‘do their own thing’ and support a range of local businesses. All racers will receive $10 in Chamber Bucks that can be spent at almost all establishments in Rice Lake (hotels, restaurants, stores, gas stations, etc.). After introducing their handmade gaiters at last year’s event, RM-Gear brings you each an exclusive Tuscobia-branded winter headband to keep those ears warm and head ventilated! Check out the website for the complete range of gear born from experience and knowledge, and developed with durability and quality in mind. RM – Roberto Marron – is a veteran Tuscobia finisher and along with Chris, the guinea pig for the inaugural 150-mile Tuscobia race in 2010. Black Rock Gear is our “official” “keep your digits and ears warm” sponsor. Black Rock Gear is craft manufacturer making high quality, ultra-light weight 950 fp down gear like mitts, hats and balaclavas. All facets of design and production happen in the USA. Their products are extremely light weight and high performing. Black Rock has agreed to donate product the Tuscobia Winter Ultra, but I encourage to check them out for yourself before race weekend because not everyone will be lucky enough to get Black Rock gear at the race. Bar Mitts are a well known staple amount the winter fat bike crowd for keeping hands and fingers from freezing solid. But runners and skiers can also take advantage of of the Poagie/Moose Mitt design. We will have a variety of the Bar Mitts products available. Thanks to Patti and Ward for their continued support of winter racing. Local author and Senior Editor of Snowshoe Magazine, Phillip Gary Smith, has been associated with the Tuscobia race for several years. He is one of a handful of people to have completed the 35-mile course on snowshoes. Phillip generously donated copies of the latest edition of his book, 300-Mile Man (Triple Crown Edition). This book is a great read for anyone interested in the Tuscobia race and other winter events. Beware: you may be inspired to attempt even greater feats of endurance. 9:Zero:7 is back as our official BIKE division sponsor, stepping up big again this year by donating a frame set (frame and fork) as well as providing gift certificates for the BIKE podium finishers. Hailing from Alaska, 9:Zero:7 and its co-owners Bill Flemming and Jamey Stull know a thing or two about riding bikes in the snow. They are on the forefront of fat bike advancement and their goal is produce the best fat-tire bike frames, components and gear available. You will see a number of the top racers at Tuscobia riding 9:Zero:7. Bar Mitts are a well known staple amount the winter fat bike crowd for keeping hands and fingers from freezing solid. But runners and skiers can also take advantage of of the Poagie/Moose Mitt design. We will have 6 Bar Mitts available for the raffle, 3 XC, 2 MTB and 1 of the new Extreme. The well spoken young ladies behind CHICKED say it best – “CHICKED focuses on empowering female athletes, professionals and life-livers to get out and compete in all aspects of the Game of Life. With a spirit of female camaraderie and a bit of competitiveness, we announce our strength. We know we can do it and we are assuring the people we pass along the way are well informed!” CHICKED will be providing product for the raffle. Gemini Lights produces an interesting line of versatile and bright headlamps. All their lamps are able to be mounted to a bike handlebar, helmet or head strap, have multiple battery options and are user programmable. And did I mention they are bright? Gemini Lights is providing a special for Tuscobia racers and volunteers, providing 25% off orders. Our Supporting Partners are providing the cherry on top for this year’s event. Many of them are providing additional product to the podium gifts, as well as supplementing the raffle drawing that is open to all participants that toe the start line. Black Rock Gear is our “official” “keep your digits and ears warm” sponsor. Black Rock Gear is craft manufacturer making high quality, ultra-light weight 900 fp down gear like mitts, hats and vests. All facets of design and production happen in the USA. Their products are extremely light weight and high performing. Black Rock has agreed to donate product the Tuscobia Winter Ultra, but I encourage to check them out for yourself before race weekend because not everyone will be lucky enough to get Black Rock gear at the race. Bar Mitts are a well known staple amount the winter fat bike crowd for keeping hands and fingers from freezing solid. But runners and skiers can also take advantage of of the Poagie/Moose Mitt design. Barr Mitts will be warming the hands of 6 lucky raffle winners, 3 pairs of Bike Mitts and 3 pairs of Ski pole Mitts will be up for grabs. Gemini Lights produces an interesting line of versatile and bright headlamps. All their lamps are able to be mounted to a bike handlebar, helmet or head strap, have multiple battery options and are user programmable. And did I mention they are bright? 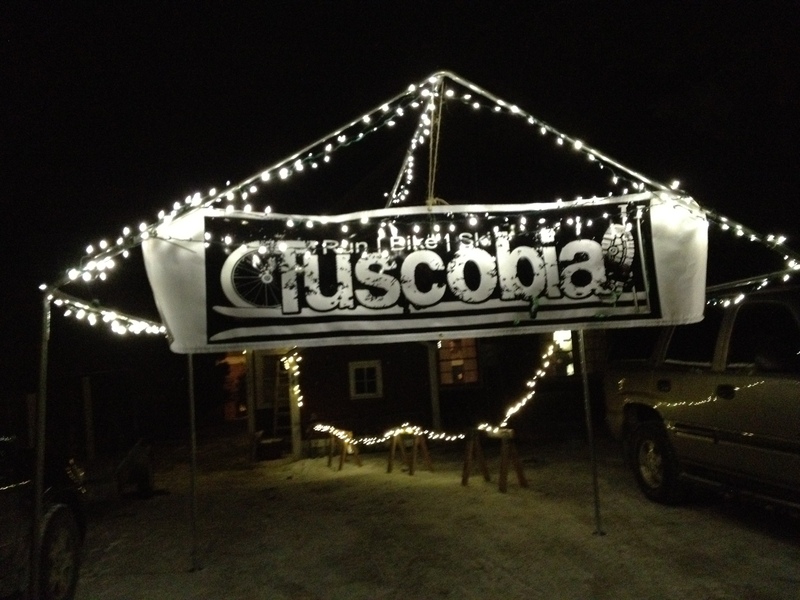 Gemini Lights ran a special for Tuscobia racers and volunteers, providing 40% off orders. We have purchased two of the Xera light systems as well and will be adding them to the raffle. St. Croix Rod Company is based right in Park Falls, WI. They have an excellent reputation in the fishing industry and are well trusted. You may be wondering how they are relevant to winter racing. Well, what’s your plan if you break down on the trail and need to find dinner before you starve to death? What other rod would you trust more than a St. Croix? All jokes aside, we are ecstatic to have a local business decide to partner with Tuscobia. St. Croix has graciously donated 6 rods from their Rio Santo product line. They will be raffled. Direct from the Stevens Point Brewery website – “The Stevens Point Brewery is steeped in a history that has transcended the trials of the Civil War, the Great Depression and Prohibition. More than 150 years later, the Stevens Point Brewery continues to successfully brew quality beer, just as the brewery’s founders, Frank Wahle and George Ruder, did in 1857. This undeniable endurance is a testament of why the Stevens Point Brewery, in Stevens Point, Wisconsin, is the 5th oldest continuously operating brewery remaining in the United States. Today, the Stevens Point Brewery is proud to be Wisconsin-owned and independently operated.” This is a brewery that knows about endurance, and is local and independent. Need I say more? Point brewery is sponsoring the live music on Saturday night. Actif Epica is final race in the quest to enter the Order of the Hrimthurs. AE is the shortest of the Hrimthurs races, but the course has the potential to be absolutely brutal if the weather is bad. AE has kindly donated two entries to their event, which takes place February 15, 2014. We will raffle the entries. Mountain Bike Radio “is THE voice of mountain biking. Mountain Bike Radio is a network of mountain biking podcasts and online radio shows, based at the edge of the Colorado Rocky Mountain Foothills, that is the place for all mountain bike talk. We discuss racing, current events, and anything in the mountain biking world. From the average joe to the top pro and from short track to multiday adventures, we aim to bring the world of mountain biking to you. It’s mountain bike talk from mountain bikers, for mountain bikers!” And the talk will be first-hand as Ben Welnak will be riding the 150. Vi Endurance will be generously providing Vi Fuel gels for the entire Tuscobia event. Vi Endurance focuses on taste, quality and performance. You won’t find any garbage fillers in their product. Their flavors are amazing, because their ingredients are real. Peach Cobbler is my favorite, especially in temps below freezing. TrekSta is our official sponsor for the “Run” mode of transport. TrekSta will be providing the male and female “Run” winners of the 150, 75 and 35 mile distances a new pair of kicks. TrekSta is an innovative little company out of Idaho that designs shoes around the shape of an actual human foot, rather than a the typical shoe shape. They also use technologies that make their shoes pretty saavy for winter races. TrekSta shoes have logged quite a few miles at previous installments of the Tuscobia Winter Ultra – and have performed quite well. 9:Zero:7 makes Fat Bikes up in Alaska. They know a thing or two about how to build a rig meant to thrive in the snow. Need proof?? In 2011, the 150 mile Bike race was on won on a 9:Zero:7. We are super stoked to have 9:Zero:7 as our “Bike” partner moving forward. 9:Zero:7 will be providing a frame, a fork and possibly some other items. Fitsok is a little company in the Minneapolis area taking over the sock world 3 pairs of socks at a time (because two-packs are just not enough). Fitsok is sort of a big deal – they have been a sponsor of the Twin Cities Marathon the past 4 years, so when they agreed to work with the Tuscobia Winter Ultra we were ecstatic. Thanks to their flexibility and willingness to work with us, every Tuscobia Winter Ultra entrant will receive a pair ofcustom ISW wool socks from Fitsok. They are a great bunch of guys making great socks. At Fitsok, our mission is simple; Give athletes the best in engineered fit and performance. We’re committed to offering products that allow everyone to excel. Whether running, biking or training, each Fitsok pushes the boundaries of moisture and temperature management. From the athletic CF-2 to the feature rich CX-3 and the advanced ISW, the entire Fitsok lineup is designed to keep feet dry, comfortable and cool. We’re excited to add our newest style, the ultra-technical F4 performance sock. Every sock is packed with tech, built right here in the USA. Twin Cities Running Company (aka, TCRC) is the premier running shop in Minneapolis/St. Paul. Staffed by runners, they are not only knowledgeable but friendly. TCRC is very involved, and ultra (pun intended) supportive of the local/regional run community. They will be providing gift certificates to the top three male and female finishers. For all three distances. That is 18 awards for the runners. Thanks very much TCRC!! Also, look for an email from us with “Electronic Goodie Bag #3.” There will be a nifty discount for all entrants to purchase waterproof shoes from TCRC. A big “Thank You” to the businesses and people below. Without everyone pitching in last year, our inaugural Race Directing event wouldn’t have been possible. Signature Sign & Graphic in Butternut, WI designed and created the finish line banner at very short notice and gave a large discount. Thank you! Note: In case it is not obvious to any of the midwest ultrarunning community (after all, there are no dead animals depicted), the artwork is by John Storkamp. Thank you John! Salsa is sending a box of schwag!! Very awesome of them to step up on such short notice. Boehm’s is family owned business that has built a bike business with second-to-none customer service. Locations in St. Paul and Mendota Heights in MN. I can personally attest to the top notch quality of their people. Boehm’s has provided schwag for raffle/awards. It will be a surprise for the lucky winners! Checkpoint in Winter. Great little cabins right along the trail. Be kind to them with your boots/gear. Checkpoint in Birchwood. They were a checkpoint last year as well, for those of you that were there. Tuscobia Happy Tails Boarding Kennels, 1911 25th Avenue, Rice Lake, WI, 54868 (715-234-3236) If your pooch needs a place to stay while your torture yourself race weekend, give Happy Tails a call. A big thank you to them for donating the use of their trailer to transport bikes, as well as a cash donation. The Harbor View Pub, Eatery, Cottage in Philips – provided items for raffle! Bob Gustafson – cutting and sanding wood wafers, for awards. Kathy Pospychalla – Property Manager, Ranger – Tuscobia State Trail. Kathy has willingly worked on the accelerated timeline Helen and I proposed to get the Tuscobia Ultra approved for use on the Tuscobia State Trail. Without Kathy’s willingness to work with us, we wouldn’t have been able to hold the event in its named locale. And Kathy is looking forward to next year.